One of the biggest challenges smaller businesses have, is learning how to hire a salesperson. Hiring your first salesperson is a great milestone for any business. If you’re at a place where your sales are strong enough to warrant putting together a team of business development reps (BDR‘s), great! But if you aren’t careful, it will cost you. These reps will qualify the leads for your Account Executive level sales team—that’s an important job. So, how do you avoid hiring someone who doesn’t fit your culture and brand? You take the (up front) time looking for high quality leads best suited for your B2B sales efforts. Then, you run them through a sweet nurturing system full of emails and points of contact that warms up the prospects and weeds out the suspects. Once they’re ready, you take them through your pitch and turn them into awesome customers that stick around for the long haul. Why would you hire any differently? Turning over (losing) an employee costs about $10k. That’s just an average. In this post, we’ll discuss the similarities between account based management as a sales strategy and the ideal hiring process for many sales organizations. These lessons should help you in learning how to hire a salesperson that can deliver an ROI. Just like you would look for certain data points to help you find the right leads to contact, you’ll need to have a profile of potential development reps.
You want people who are going to develop the revenue generation of your organization. They’ll be tweaking the personas of your customers and you should constantly be tweaking the descriptions and requirements you want new reps to meet (more on that in a minute). The (hopefully) obvious difference between buyer personas and having an ideal rep in mind are the demographics that you should avoid altogether. You don’t want “skews male” on the careers page on your site (or anything else that you should discriminate against). To help, here’s a link to the Equal Employment Opportunity Council (EEOC) “prohibited practices”. Take the culture that you currently have, or that you would like to create and the personality and experience of the person you want to hire will start to shine through. Once you have an idea of the person you want around Monday-Friday, it’s time to start writing the copy that will draw the right people to apply and send away all the others. That’s right, just like in your funnel—there are suspect and prospect hires. One of the first lines of defense against interviewing someone who isn’t a fit is to have a resoundingly clear set of requirements. In order to have everyone apply (that should), you’ll want to clearly explain the benefits. The best way to do this is to make the benefits worthwhile. You’re not going to attract the best talent unless you have perks above and beyond those at a typical office job. 3 Weeks of vacation in the first year and 4 weeks starting in year two. An office stocked with snacks and drinks. Company sponsored events, travel, and even shenanigans. Performance based fast career progression. But that’s at the bottom of the page. 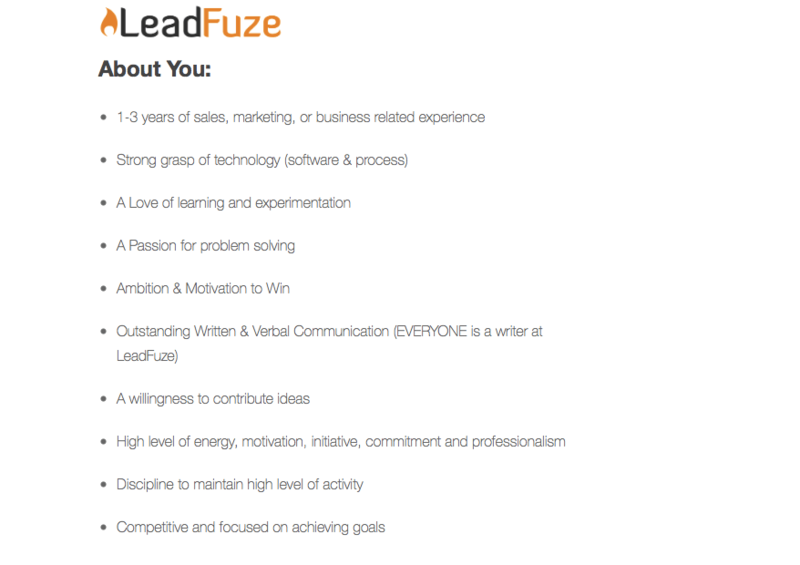 To get there you have to go through several sections about who we are at LeadFuze, and then we start laying out who’s right for the job. Here are a couple of screenshots from our careers page to give you an idea. These are the requirements for a specific role here. Even still, before we get to the perks—we take them through another round of proofing based on the character traits we want in our culture. At this point, you’re either a good candidate who is ready to apply, or a person who’s lying (to themselves, or us). Bonus Resource: HubSpot goes deep on the job description subject, specifically for sales managers (but you can tweak it). There is even a template to download. Check it out. Once you have the copy on the position down, it’s time to use your sales tactics again to find the right people. You can always put a post online and we’ll go over a couple of the best places to do so, but why not try to build your own list of “leads”? Recruiting is kind of a lost art. If you don’t have the time, there are others who do it, but without knowledge of a good service you won’t know what you’re getting. Think about the last product you bought for your business, or even yourself. We are constantly being sold in today’s society. Can you think of those people who came to you first and made you stop and think? How about the ones that got to your pocketbook? Can’t think of any? Well, there are a few good places to post a job and be inundated with potential candidates. Inbound.org: This site is for people who love using inbound marketing. They have a very active jobs page that is full of current marketing, development and sales jobs ready to be filled. The site is visited by people who have a sound understanding of marketing and sales. It’s perfect for tech and software, but anyone could probably find good help there. ZipRecruiter.com: 1 million employers have used ZipRecruiter to find and hire people for their organizations. It’s an alternative to the clunky Monster and CareerBuilder options of old. Pretty much any job from any industry can go on here. Angel.co: If you’re in the software space (like us) or a SaaS startup, Angel is a great place to find industry specific talent. There are about 24,000 companies actively looking, but the talent comes to speak with founders directly. There are no recruiters allowed on the platform. Once you got a person in front of you (or on Skype), you have to qualify them. Coincidentally, this is exactly what a good BDR is going to do once on board. There are a couple of areas that you want to test with your questions—practical things and personality things. Your business developers are going to be searching through a lot of lead data, using software and other tools to help. They’ll also be sending tons of cold emails and making regular phone calls in order to find prospects for sales. You have to make sure that they are up for the day in and day out tasks. Here are a few potential questions. How did you find leads in your last position? What CRM are you familiar with, if any? Do you like to talk on the phone regularly? 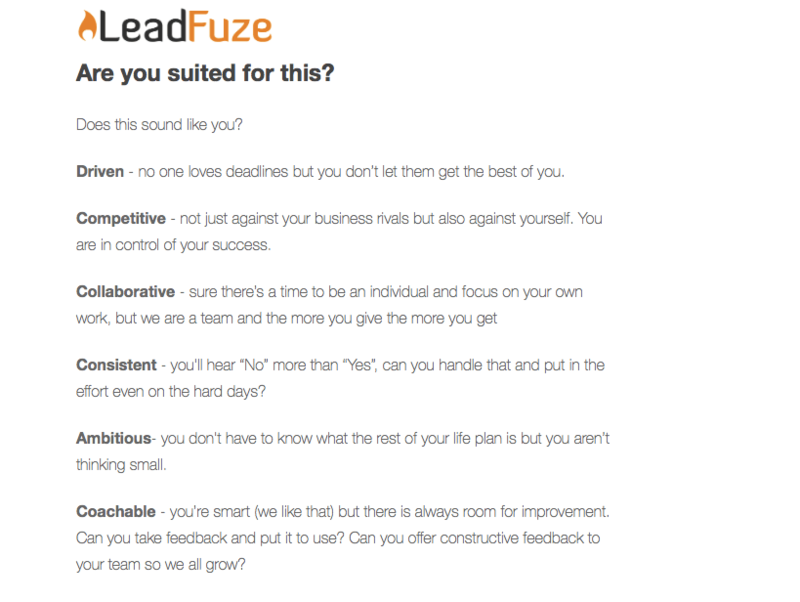 What questions do you ask when qualifying a lead? Your BDRs are going to take a beating. The same way that most sales teams don’t meet their quotas, and turnover amongst sales reps is extremely high—your development reps are going to get a lot of “NOs”. What’s worse is that if a lead meets certain requirements, they are whisked off to the sales team for a (hopefully) quick close. Imagine getting told no all day and then, when you think someone is going to say yes, they go away. A necessary job, but sometimes nasty. How do you handle being rejected (a lot)? 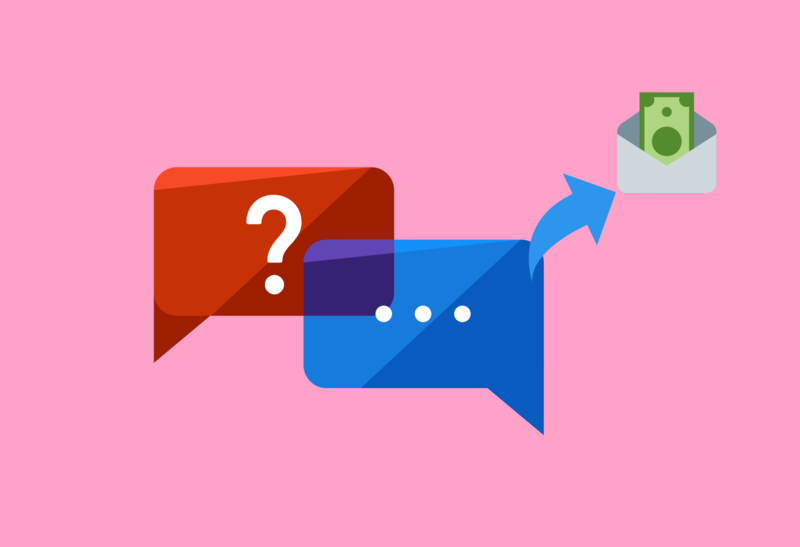 Why are you in sales in the first place? Point blank, how do you feel about finding prospects, starting the sales process, without closing any deals? Even though you make the personas, build the list, and qualify the leads—it’s you who has to make the final decision, not your candidates. The best thing you can do is look at the data (not too long) and make a call. If it turns out that someone isn’t the best fit, don’t be afraid to walk them out as soon as they make that apparent and call number two on your list. Have any other questions in learning how to hire a salesperson? Feel free to ask in the comments below. Now if you can post an article on “How to Effectively Train Sales AE’s” I would be all about that article!